Unbound's eNews and "In an Instant" video received honors for excellence in communications at the Catholic Press Awards recently in Buffalo, N.Y.
Unbound received a first-place honor in the category of Best Electronic Newsletter for the Unbound eNews, written by staff members Veronica Batton and Jordan Kimbrell. The best way to invite is to inspire. We think our stories do that. Unbound, an international humanitarian organization fighting poverty in 20 countries, received two honors for excellence in communications at the recent Catholic Press Awards in Buffalo, N.Y. The awards are sponsored by the Catholic Press Association of the United States and Canada. A second-place award went to Unbound in the category of Best Freestanding Online/Multimedia Presentation of Video for “In an Instant.” The video — by staff members Michele Batliner, Henry Flores, Luis Cocón and Cara VanNice — was produced in-house to raise awareness of Unbound’s individualized approach to sponsorship of children. Cara VanNice, director of communications at Unbound, said Unbound’s network in Kansas City and abroad is dedicated to sharing the stories of the Unbound community. "We are grateful for this recognition and the opportunity to share those stories with the world," VanNice said. "Through our print publications and digital content, people get to know the incredible families we work with around the world and see the work we are doing together. The best way to invite is to inspire. We think our stories do that." 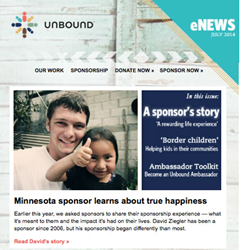 Those who are interested, can sign up for Unbound’s [eNews. To view “In an Instant”, please visit http://www.unbound.org/Sponsor. The Catholic Press Awards were given on the last day of the Catholic Media Conference, June 26 in Buffalo. The annual conference offers continuing education and networking opportunities for journalists and other communications professionals. Next year’s conference will be June 1-3 in St. Louis. Unbound is an international nonprofit founded by lay Catholics grounded in the Gospel call to put the needs of the marginalized and vulnerable first. Unbound works side by side with people of diverse faith traditions in 20 countries, bringing people together to challenge poverty in new and innovative ways. Unbound distributes direct aid as quickly and efficiently as possible to people who need it. 92.5 percent of Unbound's expenses go toward program support.